The relationship between a boy and his dog is often a special one. For Alexander Bures and his dog, Oscar, it’s an important partnership. 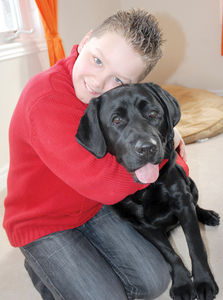 The Bures family got Oscar from Autism Dog Services about a year and a half ago. They found out about the non-profit organization at an autism walk in Toronto. After that, the family met with the organization’s director, Wade Beattie, and got on board. “The thing that really made it for us is he personally matches the dogs to the children,” said Alexander’s mother, Michelle. Oscar is the third dog Mr. Beattie considered matching with Alexander and, in this case, the third time was the charm. Oscar helps Alexander by calming him, keeping him focused and preventing him from running off. Alexander knows it’s his responsibility to look after Oscar. Since Oscar is trained not to run off, Alexander can’t run off, either, because he has to look after Oscar. Another benefit to having Oscar is he’s a consistent helper when the family’s life is sometimes inconsistent. Mr. Bures is in the Navy and as a result, the family moves fairly frequently. They came to Bradford from Toronto in Oct. 2009 and may move again in the future. When they move, the services available to Alexander change, as local health and school boards, among other service providers, don’t all offer the same things. Fortunately, Simcoe County District School Board and Fieldcrest were very accommodating. “They couldn’t bend over backwards enough,” Mrs. Bures said. She is now heading a committee in the military for families with children with special needs to help them find services when they relocate. Some autism services don’t come cheap. The family is currently raising $18,000 for Autism Dog Services to pay for Oscar. The one-time fee covers all of Oscar’s training for life. He gets training updates once a week and if he needs more, it will be covered. The family organized a Ladies Night event at the Delta Chelsea in Toronto last weekend to raise money, but they still need more. People from Wendy’s restaurants saw a story about Alexander and Oscar in a Toronto newspaper and stepped up to offer support. Wendy’s in Bradford will host a special fundraising event for the Bures family Feb. 25. The restaurant will donate 10 per cent of all sales made between 5 and 9 p.m. that night to the family, who will be on hand for the event. If you can’t make it to Wendy’s at that time, there will be donation boxes at the front counter of the restaurant if you wish to donate at another time. For more information on Autism Dog Services, visit autismdogservices.ca.